The marketing industry is amazing in the sense that you can make or break a company depending on how strategies are executed. Often times marketing can involve a lot of repetitive tasks that, albeit necessary, are also time consuming. Regardless of your industry, but especially when it comes to marketing, time is money. With the growth of technology being exponential year after year, there are numerous options when it comes to automating these tasks and interpreting the data that is gathered by doing so. But how do you know which programs are good and which are a waste of money? Here at React we deal with platforms of all shapes and sizes and are going to show you some of our favorite options for automating tasks and properly interpreting data so that you can focus more on your bottom line and spend more time on the core values of your company. There is a reason we are listing them first, and it’s not just because we are a HubSpot certified company. The options available cover every single nook and cranny of what goes into a successful marketing campaign. 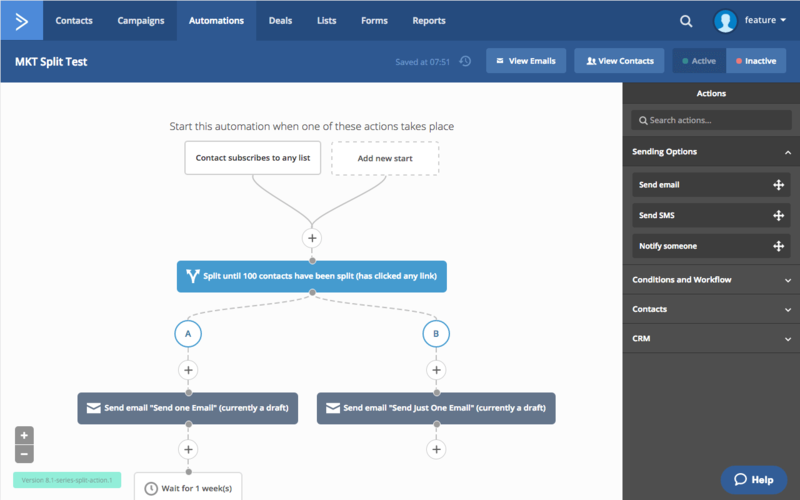 HubSpot makes it easy to automate your entire marketing workflow. SalesForce integration is a huge plus as well (though they also offer their own HubSpot CRM). With their visual editor you are able to ensure not a single person on your contact list gets ignored. This editor makes it easy to understand the proper marketing flow by letting the user visualize the entire process. Their behind the scenes “advanced segmentation logic” helps figure out who gets placed in your workflow, and when. Ensuring the best overall conversion rate and ROI. 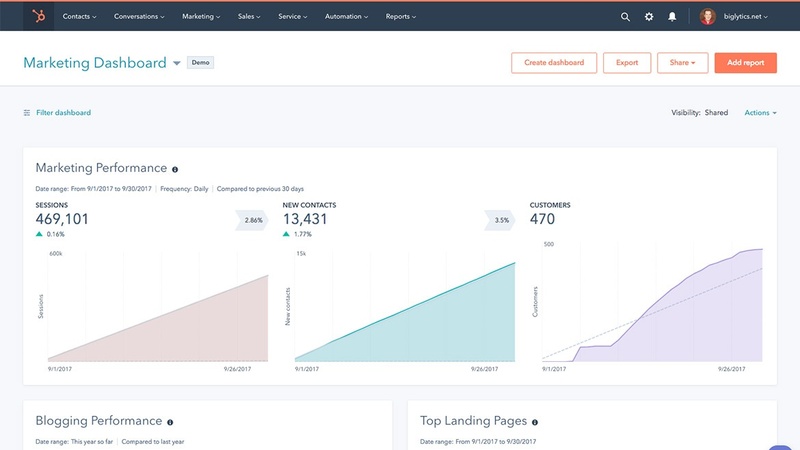 What make’s HubSpot’s marketing automation stand out? They offer a unique approach to letting users find their own way into your sales process. Emails, landing pages special offers, all can be unique and tailored specifically for each person. Ontraport is a newer company whose popularity is rising fast. This is a good company to go with if your marketing flow needs a bit more testing. The reason for this is they allow you to make everything split testable. Their integration is amazing – Google, Facebook, WordPress, Paypal, Stripe, Shopify, WooCommerce, Twitter – all of the big guys in the industry play nicely with Ontraport. View their full list of integrations here. Aside from the split testing and seemingly endless integrations, there’s plenty more to get excited about. ActiveCampaign’s parent company has grown well over 300% in the last year, and a great deal of that growth and success can be attributed to ActiveCampaign. This is an excellent option for someone who is brand new to the world of marketing automation. For starters, the pricing starts at just $17/mo, so it is a great option to get in and learn something new without breaking the bank. Another reason why it is a great choice for those unfamiliar with this side of marketing is because the give you the option to break down your sales funnel into different sections to better understand each step of the process. Logic. Create actions based on conditions. ex: If a used has visited ‘X’ website, then put them in ‘Y’ part of the sales funnel. Create unlimited deal pipelines. ex: one for free trials, one for enterprise clients, one for small business contacts. It’s so easy to use that, with little training, anyone on your staff can build even the most complex marketing campaigns. Wonderful social media integration lets you see when someone talks about your company or brand, or shares one of your web pages or links. The time and effort put into ActiveCampaign certainly shows. They are constantly listening to users, making changes based on feedback, and provide some amazing support. There are companies who like to control every single aspect of the marketing flow, and then there are those who can run a wildly successful campaign solely with email. Mailchimp is for the latter of those two. That being said, since their sole focus is on email marketing, they are the best in their field for the job. Every imaginable feature needed to run an email campaign of any shape or size. Easy integration available with just about any eCommerce platform on the market. Integration with Facebook, Instagram, and Google to execute successful online ad campaigns. For those who do business solely online or who simply want to start an email newsletter, MailChimp is a great choice. And, in the future, if you decide to go with a more powerful platform, MailChimp integrates nicely with other marketing automation software options. Although there are many platforms available, the process isn’t always easy. In order to take advantage of every aspect of the marketing automation process it is best to go with professionals who can help you set up and properly use a platform that is suited to fit your business. React have been helping businesses of all sizes in the UAE automate their marketing. Contact Us today to speak with a specialist about a platform specifically tailored to your needs.